It will cost travelers a little bit more to visit Puglia’s Tremiti Islands in 2014. The landing tax was increased to two euros, up from 1.5 euros, by the islands’ Municipal Council on Friday as a way of easing the municipality’s budget problems. The landing tax must be paid by all non-residents upon arrival at the Tremiti Islands, an archipelago in the Adriatic Sea situated north of the Gargano Peninsula. That includes tourists, ferry passengers and beachgoers. The Tremiti Islands are a major tourist attraction for Puglia, chiefly because of their beaches, grottoes and clear waters ideal for swimming, boating and diving. The islands attract approximately 100,000 visitors during the peak summer tourist season. La Gazzetta del Mezzogiorno reports that island officials hope to collect at least 250,000 euros in landing tax revenues in 2013 to help defray the Municipality of the Tremiti Islands’ current deficit of 7 million euros. To learn more about the Tremiti Islands or to plan a visit, go to the Italian Government Tourist Board website at http://www.italiantourism.com/island7.html or the Azienda di Promozione Turistica di Foggia (APT Foggia, the local tourist board) website at www.pugliaturismo.com/aptfoggia. Italy’s minister of tourism and culture, Massimo Bray, had high praise for the Museo Nazionale Archeologico di Taranto (National Archaeological Museum of Taranto), during his visit on Friday to celebrate the opening of new exhibit halls at the Puglia landmark (see our earlier blog). Bray also called for vigilance to safeguard Puglia’s, and Italy’s, priceless antiquities. Bray, who has been Italy’s minister of tourism and culture since April, was born in Lecce. He is a co-founder of “La Notte della Taranta” (“Taranto Nights”), one of Europe’s most popular music festivals. There’s something “new” to see at the Museo Nazionale Archeologico di Taranto (National Archaeological Museum of Taranto), where Puglia’s past is on display. We’ve visited the museum and found it contains a fascinating collection of artifacts from Puglia’s antiquity. If you have even a casual interest in world history or archaeology, it’s definitely worth a visit. 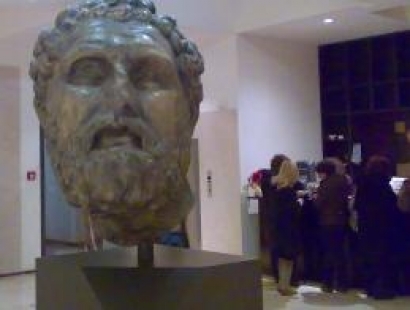 The new sections of the exhibition at the National Archaeological Museum of Taranto are dedicated to the Hellenistic necropolis, the Roman city and town between late antiquity and the Byzantine age. You can admire numerous pieces of jewelry (rings, earrings and necklaces) characterized by the presence of glass paste and colored stones, polychrome terracotta figures produced locally in close dependence on the Greek tradition of craftsmanship. There are also bone, ivory and colored-glass items that characterize the importation of kits of cremation burials of the Imperial Age. A collection of paintings donated by Monsignor Ricciardi at the museum dating to the beginning of the 900s is shown in a new space between the first and second floors. Also, the exhibition devotes ample space to geometric and figurative mosaics of public and private buildings in late antiquity and the early Medieval period. The museum was opened in 1887 by archaeologist L. Viola with the intention of making it a museum of Magna Grecia (areas of southern Italy’s coast that were inhabited by the Greeks), but the museum now contains archaeological documentation of Taranto classified on the basis of a precise scientific orientation. The rooms in the museum are organized chronologically (the pre-historic and proto-historic, Greek, Roman and early Medieval periods). The city of Taranto and its history, evolution and culture are the focus of all the exhibitions through artifacts identified with the territory for their origins or discovery. The artifacts are displayed in context to their places of origin to permit a more accurate reading of the rituals and other ways in which the objects were used. The museum is located at Via Cavour, 10-74100, in the City of Taranto. Telephone: (+39) 0994532112; fax: (+39) 0994594946; website: www.museotaranto.org; and email: museoarch.taranto@beniculturali.it. 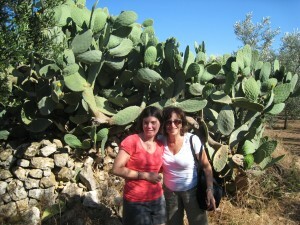 Traveling in Puglia and getting to know all its fantastic events have never been easier. Both viaggiareinpuglia.it and pugliaevents.it are innovative tourist web portals of the Region of Puglia. The first is completely dedicated to the territory and its itineraries; the latter is dedicated to events and cultural offerings. Thanks to viaggiareinpuglia.it, available in English and German, you can organize your own holidays in Puglia with just a click and discover all the excellence of this region, hotels and historical farms where you can accommodate, restaurants where you can taste the exceptional local cuisine, and the most exclusive wellbeing centers in Italy. Routes, beaches, little villages, these are just some of the many information the web portal offers to curious tourists. You can download multimedia contents and search about art and culture, spiritual places, wine and food, nature and landscapes, events, sports, seaside and movie tourism. If you download the Puglia reality+ application on your smartphone you can experience this region in a wider reality, with a new experience of exploring the territory, the nature and the culture. Viaggiarepuglia.it offers an area dedicated to tour operators as well so that they can find useful information and also participate with ideas, advices and suggestions for the local tourist planning in order to make Puglia’s tourism more competitive and of a better quality. Pugliaevents.it is the new integrated communication system promoting and spreading in Italy and abroad the events taking place in Puglia. This project aims at creating a tight relation among the many actors of the events and the tour operators. The web portal pugliaevents.it is a platform to use via web or with a mobile device and it gives information about movies, music, theater, dancing, business and fairs, sports and environment, food and wine, traditions, entertainments, art and culture. On this platform, users/potential tourists interact continuously with cultural and tour operators and can make their choices more easily by having a quick access to many options and suggestions for planning and making their trip in Puglia the way they like. Tourists surfing on web portals can find detailed and up-to-date information about itineraries and events. Users communicate what they have experienced by posting and sharing private pictures and comments on the web. Web portals offer services that match what users need and look for. The portal is integrated with Facebook and Twitter and can be easily checked with smartphones and tablets to always keep at hand all the information you need. The Region of Puglia’s Assessorato al Mediterraneo, Cultura e Turismo, the agency that oversees tourism marketing and management policies for the region, has compiled “Focus United States of America,” an overview of the U.S. tourism market to Puglia to assist tourism developers, tour operators and guides, travel agents, hoteliers and others involved in the tourism industry. It is an interesting study of a market that is still growing in importance for the region as a quality international tourism destination. Initially supported by substantial expansionary fiscal and monetary policy maneuvers and the rebuilding of inventories, U.S. economic recovery seems to be powered now by a revival in demand both for consumer goods and for investments. However, in the tourism market, the most direct competitors to Italy are very active in the U.S. market. Advertising campaigns launched by certain European and non-European competitors, through TV commercials, billboards and advertising pages in newspapers and magazines, as well as extensive use of the internet, are frequent, highly visible and the result of substantial financial investments. 1. Main months for travel are spring and summer. 2. Main types of transportation U.S.-Italy air only; travel within Italy: train, bus and car. 3. Main tourist products are art, nature, food and wine. 4. In 2011, in Italy there were 4,466,672 arrivals (+5.4% compared to 2010) with 11,515,881 overnight stays (+6.5%) from the U.S. with an average stay of 2.5 days. 5. Approximately 89% of arrivals were concentrated in hotels. Bank of Italy data on tourist spending of Americans in Italy showed an increase of 12.1% (from 2.983 million in 2010 to 3.345 million euro in 2011). 6. In 2011, Puglia, welcomed 0.6% of U.S. tourism in Italy. The average stay of 3.04 days is higher than the national average. In 2011, incoming tourism from the U.S. recorded discordant values. Compared to an increase of 3.1% in arrivals exceeding a number of 27,000, overnight stays fell by 3% compared to the previous year, falling below the threshold of 80,000 nights. The year 2012 was characterized, however, by a substantial increase in arrivals and overnight stays (+10.43% and 13.38%). Overnight stays thus reach the number of 88,000, placing the U.S. tourist market in the sixth position in regional ranking, up three places from a year earlier, preceded by Belgium (116,000 overnight stays) and followed by Austria (87,000). The arrivals have instead exceeded 30,000 units. (Fasano, Lucera, Manfredonia) and beach locations, from Salento to Daunia: Otranto, Monopoli, Polignano a Mare, Trani and Vieste. There is a high concentration of arrivals in May (13.5% of arrivals), June (13.3%) and September (20%). From the data on tourist flow generated in the region, a strong focus on quality of services has emerged. Not surprisingly there was a predilection for staying in 5- or 4-star accommodation. This tourism is also characterized by the propensity for seasonal adjustment of flow, a need which, combined with the high quality requirements, has to be met by adequate management of the use of territorial services. Since this is a highly attractive market for many competitors, it is advisable to enhance and target the promotion strategies for this popular basin. Given the common use of the Internet in the United States, the promotion sites of the destination play a crucial role. The evolution of profiles characteristic of the American tourist who intends to spend his/her holiday in Italy has undergone a diversification in terms of expectations and goals. The majority of potential tourists use the Internet to evaluate and choose the travel offers. The need to adequately restructure the marketing and sales system has thus emerged, redefining the role of intermediaries (tour operators, agencies) and diversifying the territorial offer more wisely and the way of presenting the same. For further information visit www.viaggiareinpuglia.it. 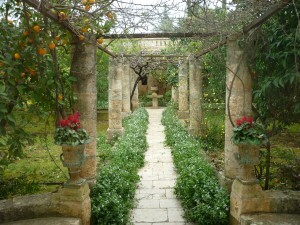 The entrance way to the orange and lemon groves at the Masseria Marzalossa near Fasano. Puglia, the little-known treasure located in the heel of the boot of Italy, is becoming a favorite with travelers of all ages. It is a special place to see and experience a rare cultural and sensual phenomenon that makes you want to return again and again. National Geographic Traveler magazine has just listed Puglia as a 2014 “Best of the World” destination. Whether you’re a food and wine lover, a sports adventurer who enjoys biking and sailing or an explorer of history and culture, you can have a reasonably priced trip and enjoyable experience with all the wonderful trimmings in Puglia. On my most recent trip to Puglia, I combined a visit to the charming Masseria Marzalossa, a 17th Century restored farmland estate near Fasano, with a few days’ stay at the Sheraton Nicolaus Hotel and Conference Center in the heart of Bari, the capital of Puglia. Both lodgings offer the ambiance of both old and new world accommodations and amenities. When you arrive at the Masseria Marzalossa, the exuberantly friendly Guarini family greets you at the door of this historical landmark. They immediately make you feel at home and ready to relax. A traditional breakfast includes a large glass of orange juice, freshly squeezed from the orange grove. The omelets are absolutely delicious. I took a peek in the kitchen as breakfast was being prepared. If you’ve never seen a Puglian farm egg, the yolk is rich orange in color, not pale yellow like you’re used to. A simple omelet, cappuccino and some tasty warm bread and homemade fig jam was pure heaven! The Masseria Marzalossa specializes in catering to American and European travelers who enjoy a quiet and relaxing retreat. When the sun goes down in the late fall, you only have to step into the Renaissance-style living room, sit near the fireplace and sip a toasty glass of the local primitivo or negroamaro red grape wine before or after dinner. The masseria is located near Fasano so it was an easy drive into town to pick up a few things and enjoy the local flavor in the town square. A late morning espresso and an exquisite almond-filled pastry never tasted so good! Make it a point to experience the town life as well as farm living. Each one gives you a sense of the local food and wine favorites and you get a chance to meet nice people, including some who own businesses in the area. They love to share their little known snippets of local history and culture. The night before I left, I had an urge for pizza. The Guarini family recommended Il Rifugio dei Ghiottoni in the center of Fasano. It was inexpensive and delicious. This is where you taste original brick-oven pizza, a light crust with fresh local cheese and tomatoes melting on your palate at just the right temperature. Yummy, yummy. On the second half of my trip, the plan was to tour the historical area of Bari and its large shoreline. I enjoyed a comfortable stay at the Sheraton Nicolaus Hotel and Conference Center. It’s an easy drive from the modern Bari “Karol Wojtyla” Airport, which is currently adding a new international extension as tourism continues to grow. What’s nice about this hotel is that you enjoy all the modern conveniences, services and amenities. It’s a Starwood owned hotel with a very accommodating staff that goes out of its way to make you comfortable. The hotel offers a breakfast buffet with a nice variety of choices. I especially enjoyed the ham and eggs and pastries one day and the fruit yogurt and omelets the next. For a late breakfast one morning, a fruit and cheese plate and a morning espresso hit the spot. Another enjoyable feature at the hotel was an afternoon aperitif and a tasty snack before dinner and enjoying a small pastry filled with cheese and tomato, perfect for a late afternoon pick me up. The hotel’s international restaurant and wine bar offers a large selection of local wines and cuisines on the menu. While I was there a popular international concert group was in town and I learned that Bari is a popular tour stop for a number of bands and concert singers. I’d like to share with you a very special seafood and pasta restaurant in Bari. It’s called Le Rune and it’s what I’d call a five-star dining experience without the five-star bill. I met up with a group of friends and ordered family style, leaving our choices to the owner and the chef. Did you ever taste a light pistachio cream sauce over triangular shaped cheese ravioli? If you haven’t you’ve missed one of the best pasta dishes of your life. The fresh salmon was superb, as well as oysters on the half shell. (They were so good, I forgot to add lemon.) The drive back to the hotel was picturesque as Bari is beautiful at night when it’s lit up, the opera house and other cultural institutions ablaze under the starry late autumn sky. The coming year is an excellent time to visit Puglia’s sights, sounds, scents and to savor its unique cuisine and wines. The prices are reasonable and the people are extremely hospitable, something you can count on when you visit the small towns and villages. I selected EuropebyChoice for my travel arrangements. I like them because they create a variety of seasonal tour packages for small groups who have specific areas of interests. 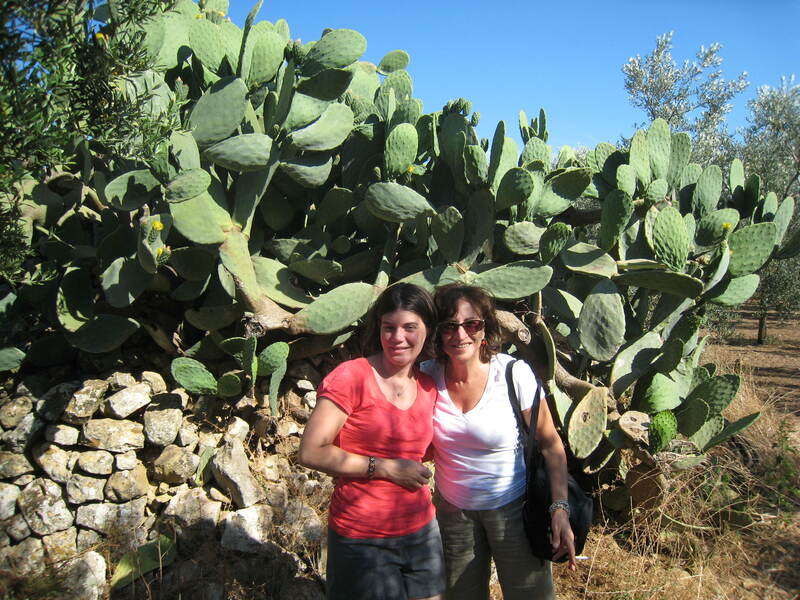 These travel experts were born in the region of Puglia, so they know firsthand where to get the best value for lodgings, dining, car rentals and day tours. So after my fourth trip to Puglia, I can only say, you must go and after you do, you’ll never be sorry. Only eager for yet another visit. If you would like to learn more about Puglia, the United Pugliesi Federation of Greater New York and the website Puglia Connection offer timely news, travel tips and event happenings around the tri-state area during the year. 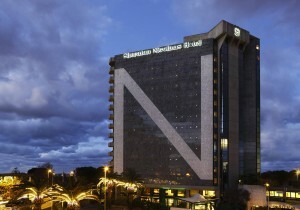 The Sheraton Nicolaus Hotel and Conference Center in the heart of Bari. 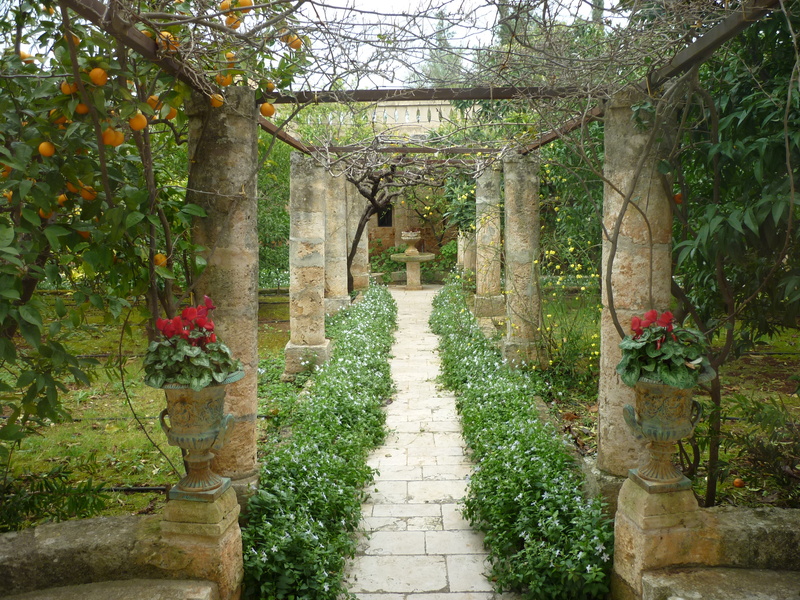 You are currently browsing the Puglia Connection Blog blog archives for December, 2013.